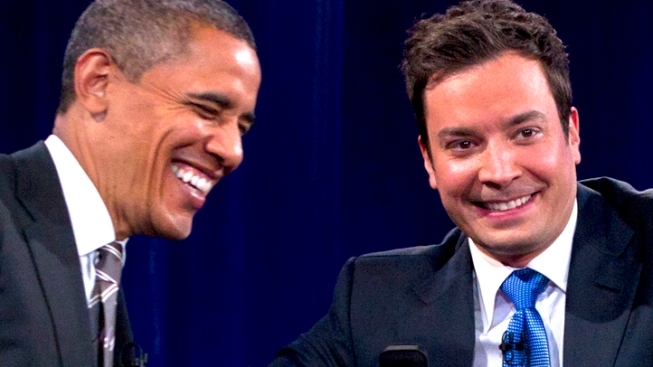 Fallon Welcomes the "POTUS with the Most-Est"
The president appears tonight on "Late Night with Jimmy Fallon"
Fallon called it the "holy crap edition" before introducing the president. President Obama's appearance on "Late Night with Jimmy Fallon" may have earned him a new nickname: The POTUS with the most-est. That's the line a background singer crooned as the Commander-in-Chief "slow-jammed the news" at a taping of the show at the University of North Carolina, Chapel Hill today. Fallon called it the "holy crap edition" before introducing the president, who emerged to wild applause. Above a bluesy background tune, the president spoke to a student-heavy crowd about Stafford loans—an apparent theme of his visit to the University. They clapped and cheered throughout the musical number, which was interjected with the occasional Fallon riff. After his rock star entrance, Obama revealed a few personal tid-bits, including the story of an embarrassing moment on the job. Obama apparently exited a human rights awards ceremony hosted at the White House a bit too soon and was confronted by a staffer. "We had to turn around and walk back," he said. He also talked about his entertainment preferences, reminding the world, if there was any doubt, which team he roots for. "You gotta go with the Bulls." He doesn't get a chance to watch too much television, he said, and likes "Groundhog Day," though the movie might not be his true favorite. "I'll date myself when people ask me what kind of comedies I like." Fallon then got to tougher topics, like the Secret Service scandal and the 2012 presidential race. "The Secret Service, these guys are incredible," he said. "They protect me, they protect our girls. A couple of knuckleheads shouldn't detract from what they do. What they were thinking, I don't know. That's why they're not there anymore." And on the man who's eying his job: "I've met [Mitt Romney], but we're not friends. His wife is lovely." He added that Romney "seems like somebody who cares about his family."